I previously reviewed Matsukawa’s two volume series Late Advent, so I was interested in checking out some of her one-shot works that are now available on emanga.com. Not for a Student and Hush a Bye Baby are both collections of stories, with one long anchor story for each volume followed by a few shorter stories. Miki is a photographer who abruptly decides to become a teacher when losing a competition scuttles her chances of a professional career. Before her student teaching stint she has an odd encounter with a waiter at a nightclub who is so compelling that she has to photograph him. Imagine her surprise when she finds out that he’s Takase Misaki, one of the worst students in the class she’s been assigned to student teach. Takase is constantly skipping school, only showing up when he feels like it, and the rest of the students in the class seem to be in a bit of a conspiracy to help him get away with whatever he wants to do. Miki has the desire to prove what a great teacher she can be by trying to help him, but her efforts are met with a surprising degree of intimidation and blackmail from Takase. As she discovers the secret he’s protecting, she begins to act in a very un-teacher-like manner. 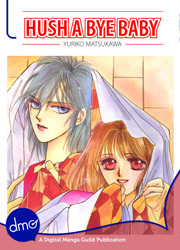 This volume was an enjoyable collection of shojo short stories. 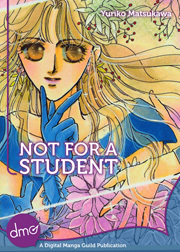 In addition to Not for a Teacher, it included a story “Aim for Acclaim My Beautiful Hostess!” about the trials and tribulations of a traditional inn owner in Tokyo and her unexpected romance and another story, “Put Your Right Foot Forward” about a girl pursuing her passion for dance only to get caught up in a rivalry between to potential partners. Matsukawa’s art still has that old-school style that I enjoy, and this collection was a pleasant diversion. Not For A Student‘s more dramatic story was balanced out by the slice-of-life stories in the rest of the volume. I found Hush A Bye Baby: Midnight’s Rebel Army a bit more entertaining than Not For A Student, just because the premise for the main story was more crazy, as convenience store worker Sakaya finds herself accidentally handcuffed to cute, yet tragically haunted biker Reiji (just like the 39 Steps, but not!) who has a mysterious past. Don’t all tragically haunted bikers have mysterious pasts!? Sakaya ends up helping Reiji investigate the truth of an accident he was framed for, and they grow closer in the process even though they have to endure being shackled together for a couple days. My only complaint with the art for this story is that the chain connecting the handcuffs seemed to randomly expand and contract at various points of the story, but on the whole it was still very entertaining. I always enjoy linked short stories and restaurant settings, so the other half of the volume was a treat. “No Saint of Soupe” deals with a French Restaurant in Japan, and a romance between the owner’s daughter and a gifted chef named Rene who only specializes in soups much to his brother’s dismay. “Professional Passion” turns the focus on Rene’s older brother as he deals with an inexperienced reporter who is assigned to cover him for her first big professional story. If I had to pick between these volumes and only recommend one, I’d go with “Hush A Bye Baby” since the combination of manacled bikers and foodie manga is pretty irresistible. Both volumes were entertaining though and would provide a quick entertaining read for any shojo fans looking for single volumes of manga.